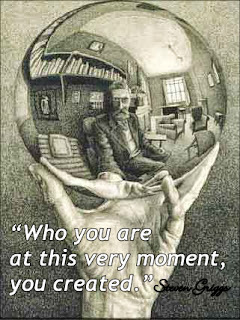 Who do you see when you look in the mirror? Do you accept who you see? Is this the real you? Are there things about you or your life that you would change? Looking in the mirror for many people is a torturous process. They see so much that they don’t like, things that they might even hate. They get reminded of their weaknesses or their failures or of their unrealized potential and uncompleted goals. They don’t see the person they wanted to be. The hard truth is that you created you. Who you are at this very moment, you created. It’s not as if you actually sat down and designed yourself but in a way you did, it just didn’t happen all at once. You are the sum total of your all beliefs, your positive beliefs and your limiting beliefs. This is it. What you see is where you are, at this moment. Everything is how you designed it: the way you look, your confidence or lack of confidence; the way you interact with people or don’t interact; your good habits and your bad ones; your current circumstances and your monetary status; the way you make your money; the woman or man you choose. Plus the challenges you create for yourself, the drama that may exist in your life. So the question is: when you look in the mirror do you see yourself as a finished product or as unfinished business? For some, it may be hard to tell the difference, especially if you believe that life happens to you instead of you happening to life. Because if you ever look out at the world and can see a reason why it hasn’t worked out for you, you are a victim. If you ever think life has thrown you a few curve balls, you are a victim. If you think you were dealt a bad hand and have had nothing but bad luck, you are a victim. Until you understand and accept that you created your life, that you brought about every event and episode in it and that you wrote every chapter, you will remain a victim. But the best part is that once you get it, once you accept that you are the creator and take ownership, you can change it all. Anything you really want to change, you can. And I mean quickly. I also don’t believe that obesity, drug abuse, alcoholism or any other affliction we humans deal with is necessary. Be careful of the word “addiction”. It is a dangerous word because addiction implies no control. It is a kind of invitation to let go and allow yourself to float down stream. It is not absolutely required even if your family may have a genetic disposition toward addiction. That same genetic disposition appears in many people who choose not to allow situations or circumstances that lead to food, alcohol or drug abuse into their lives. But on the other hand, if you choose to allow addiction into your life, that is your choice. It could be that you need to understand the full meaning and reality of some kind of abuse or addiction. Maybe you will need to do it for a month, a year or even 20 years. It doesn’t really matter. This is your life, your path. You are here to learn. But if you are ready to turn a new page, then start. Look in the mirror and decide. If you are where you want to be, more power to you, good on you. If not, what is missing? What is needed to become who you really are? What is needed to fulfill the promise and potential you know you have? First: Accept that you create your life. Second: Forgive yourself if you got off track. Turn the corner. Third: See who you want to be. Get a picture of how you want it to be.